Have you ever heard of Tree-tomato? Have you ever tasted this delicious variety of tomatoes packed with vitamins and many other benefits? If not, then this post is for you! Juicy, sweet and citric, Tree-tomato is a small oval-shaped fruit. Also known as Tamarillo tree tomatoes are thought to have originated in the semitropical high-altitude Andes forest of Brazil and Peru. Tree-tomato, also known as “Tree Tomato”, is now cultivated in many parts of the world. One of the largest producers of tree-tomato is New Zealand. The name was revised to differentiate it from the ordinary tomatoes, thus emphasizing on its exotic variety. Tree tomato farming is gaining popularity in East Africa and especially Kenya where it is earning farmers a lot of money. Tree-tomato is packed with vitamins A, C, E and pro-vitamin A. It has a good source of B-complex vitamins such as niacin, thiamine, and riboflavin. Other nutrients in tree-tomato are carbohydrates, protein, fat, calcium, potassium and sodium. It also contains minerals such as, phosphorus, manganese, magnesium, copper, zinc and iron. It is fortified with many nutrients that help improve the immune system. It is beneficial for people who want to lose weight. Consumed raw, sprinkled with herbs or in the form of salads, the juice of tree-tomato acts as a detoxifier when consumed. Its acidic properties help cut down fat. Exercising, in addition, can accelerate the results of weight loss. Tree-tomato offers vitamins A, C and E to ensure your skin stays healthy and radiant. Anthocyanin, phenols and flavonoids protect the skin from oxidative stress, pollution. Tree-tomato also helps in anti-aging. Just as regular tomatoes, these can be used in home remedies for various skin problems. The chlorogenic acid present in tree-tomato helps lower blood sugar levels in type-II diabetes mellitus. Tree-tomato contains excellent antioxidants, which can reduce oxidative stress in organs such as the pancreas and the liver. Eating the pulp of tree-tomato, or consuming its juice on a light stomach would ensure better results. In Ecuador, the natives warmed tree-tomato leaves and wrapped them around the neck to treat inflamed tonsils. The absorption of heat via leaves helps reduce pain. The Columbians make a poultice of the fruit by cooking it in embers for external medicinal use. Increase your tree-tomato intake to lower the levels of high blood pressure. Loaded with good sources of minerals and potassium, this fruit helps control blood pressure. Potassium, a nutrient abundantly present in tree-tomato, helps to balance the harmful effects of high sodium levels in the heart. It provides magnesium for the proper functioning of the cardiovascular system. 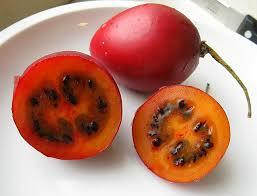 Also, tree-tomato contains high fiber content that helps restrain absorption of bad cholesterol in the body. Due to its excellent antioxidant properties, it helps reduce oxidative stress that may otherwise lead to stroke. Tree-tomato fruits are also very good for maintaining healthy eyesight. Vitamin A restores the moisture of the membranes of the eyes which act as a barrier to bacteria and viruses. It protects the eyes from infections, and reduces the damage of eye disorders such as cataract and macular degeneration. Anthocyanins contained in the darker tree-tomato have potent antioxidants, which help combat free radicals that cause cancer. They also have anti-microbial and anti-inflammatory properties that stave off cancerous outbreaks. Now that you know about tree-tomato health benefits, go ahead and check out one of its recipes! Add cumin seeds and sauté for a minute, after which you can add the diced onions and sauté for 2 to 3 minutes. Once slightly tender, add the multi-grain sprouts and sauté on a high flame. Alternate the flame from low to high, sauté for another 3 minutes. Sauté on a high flame, adding salt. You can season it with Indian or Italian seasoning, which is optional. Do you have an unused land? try our grafted tree tomatoes. For more information visit our office.